Veteran pacing males continue in the crowded and talented George Morton Levy Memorial Pacing Series at Yonkers on Saturday, April 2. Another six, 1-mile divisions add to another stakes-series-filled Yonkers weekend, which includes the continuing of the Sagamore Hill, Bluechip Matchmaker and Petticoat series. With $50,000 on the line in each division of the Levy again this Saturday, the Free-For-Allers battle to earn a chance at the April 30 final. 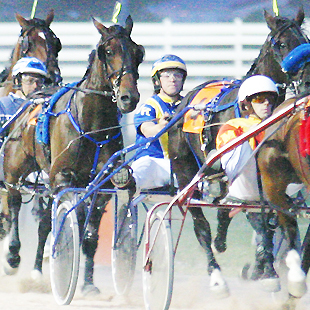 This week’s free-for-all harness-handicapping product for “Levy” players is available by clicking here. Take advantage of these tools, which will be available every Saturday during the series. In the first division of the Levy series, Race 6, the likely favorite Foreign Officer will be tough to beat again. He went the fastest of all divisions last week, winning in 1:52.4. The one to watch though is Legal Litigator. He had to go three wide as Mainland Key N broke and interfered with most of the field. In the second division, Race 7, Valentino is the horse to beat and is the likely favorite. He closed to finish fourth in round one, after being shuffled to the back of the field. Watch for good odds on Southern Allie for an upset. She was badly hung but was still able to hold on for third. In the third division, Race 8, Blatantly Good will likely take the bulk of the public’s money after winning last week. The one to beat in this field, though, is Poker Hat. He broke last time and still came and during the worst trip you can ever have he returned to the mix of the race and was hung. Also dangerous are Real Celebration and for value with these two in exotics, Forensic Z Tam. In Race 9, the fourth division, Lahaye will likely be the public choice. He won the first leg easily, which is why the horse to beat him is Mainland Key N. If he stays flat, which he should, he will be a fierce competitor. In the evening’s penultimate division, Race 10, there is no clear favorite as we see. But the one to watch for value here is Classic Rock Nroll. He was hung for two quarters and still finished third. He will be tough. In the last division, Race 11, Foiled Again will be tough to beat as he looks to sweep the legs and go for another championship. The one that will try to beat him is Trueys Legacy. He had trouble racing from the outside last time. Moving inside will be a huge help. Friday, April 1, Yonkers presents the second round of the Bluechip Matchmaker. In the first division, Race 8, On The Glass will be the likely favorite. Last week, she closed hard to just lose to Save My Shark by a length. The one that could upset in this field is Twin B Tiara. Last time, she was hung in the second fastest quarter of the race, :28.4 at three-quarters. 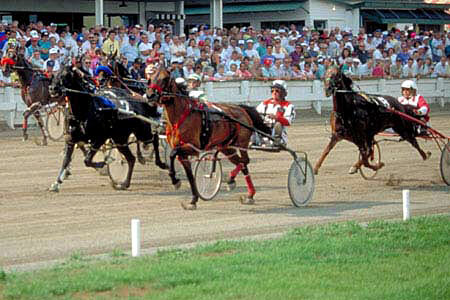 Park Avenue and Omen Hanover parked her out. In the next division, Race 9, Symphony In Motion should get the favorite spot and is the horse to watch in this race. She was hung far behind the leader and faltered to fifth in round one. Brian Sears takes back the drive for trainer Mark Harder. Also watch Jasperthat A. She was shuffled back and found cover in the middle of the race. She closed to finish third. In the third of four divisions, Race 11, Ginger And Fred is coming off a sharp win in the first leg. The 2010 series winner got her first win of the new season. But the one to watch is Hula’s Z Tam. She closed late at the end of the race to dead heat for third. Also watch Ramona Disomma. She was shuffled back and came on strongly in the last hundred yards. But she had to settle for fourth. In the nightcap, Race 12, Save My Shark will be the likely favorite after beating On The Glass. She went wire to wire, winning in 1:54.4. A horse that will be competitive here is Farmers Tuition. She was hung last week and dead heated with Hula’s Z Tam as they were gaining on Tomorrowpan. In the Youthful Stakes Final at Woodbine, the two horses the public will not ignore are the elimination winners, Calgary Seelster and I’m Feelin Good. But one they will ignore is Fox Valley Yukon. He was shuffled back and closed to finish second to Calgary Seelster in one elim. Also watch Cobalt Man. He went a fast opening quarter and gave way but should do better with the big dough on the line. In the Spring Pacing Championship, April 2, Alexie Mattosie looks like the public choice but we are keeping an eye on Lisagain. The best he has done in stakes races was in Canada. Also in the mix, you cannot count out Hypnotic Blue Chip. (2) Gentle Dragon was third while well backed and picks up some uneven competitors in this race. (8) Incredible Gambler should race better against these than he did placing as the favorite last out to the 9 horse here. (3) Natty Lite was a dead heat for second last out and may go off at better odds here, where it looks like easy pickings. (3) Don’t Dally Witch was in our ticket last week and fired for the lead from the outside at 8-1, leading a good piece of the mile. (7) Messina raced better than 36-1 and looms the outsider than could topple tickets. (1) Alias Jones closed so strongly last week that this week he looks best in an unimpressive field. If you want to use all of these, the ticket cost $8. We are considering six horses in the Sagamore Hill series, round two at Yonkers, April 2. In Race 1, Cooperstown Kid (1); Race 2, P L Dragon (1); Race 3, Dragon Laws (5); Race 4, Electrofire (3) and (6) Untold Legend and Race 5, Army Hanover (4). In the Petticoat on April 1, we are considering seven horses. In Race 1, Nanette Hall (1); Race 2, Four Starz Roe (6) and Free Fi Girl (3); Race 4, Hank’s Queen (3) and Sir Jillian Z Tam (4); Race 5, Moving Art (7) and Race 6, My Juliana’s Girl (3).